In Karnatak the ceremonial dances with ritualistic overtones are called by the generic name of Kunita. Like Pat-da Kumita, another such dance is Suggi Kunita. It is performed by the farming Halaki Vokkaligas of the North Kanara. The Suggi procession is taken out on the occasion of Kamana Hunnime amdist elaborate arrangements. 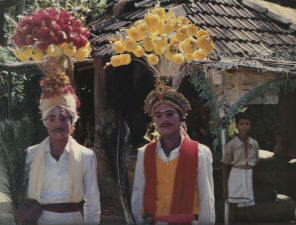 The headgear of the dancers, called Turayi, looks like birds perched on crop and is particularly eye catching. Each dancer holds a small stick and a bouquet of peacock feathers in his right hand. The singing and dancing suggi procession is greeted in every house with aarti. When the procession returns, Karma is burnt, followed by festivities. The Suggi Kunita is believed to eradicate diseases in the village, bring rains and fulfill the wishes of the people.